Rolling into the 29er Stage family we welcome the new Orange Stage 4. If you know our Segment model, this is its replacement. Short travel and big wheeled, this 120/110mm travel 29er can ride way beyond its travel figure, carefully reworked geometry and frame construction brings our compact rear to the new model with the same plus points we get through the range; more active and improved effect on small bumps. 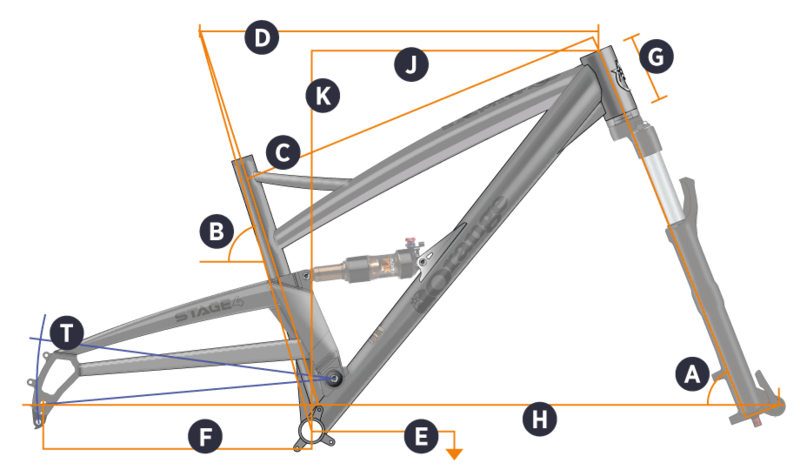 The Orange Stage 4 uses 190 x 40 'metric' rear shock sizing which brings us several advantages. Firstly, compared to the legacy sized shocks we get more internal space for the shock to do its work. With a short travel shock this is a real performance benefit allowing the shock to run cooler when things hot up. Greater overlap in the shock's bushings bring more lateral stability to help counter natural lateral flex. Sunset Cycles offers the 2018 Orange Stage 4 RS 29er full suspension trail bike with up to 36 months 0% finance and free delivery. Seat Tube Length 17" 19" 21"